"Everything connected with Marceline [Missouri] was a thrill to us [the Disney family], coming, as we did, from a city the size of Chicago. The cows, pigs, and chickens gave me a big thrill, and, perhaps, that's the reason we use so many barnyard animals in the Mickey Mouse and Silly Symphony pictures today. Who knows? You know what the psychologists say about the importance of childhood impressions," wrote Walt Disney for the September 23, 1938, Golden Jubilee edition of the Marceline News. His daughter Diane told me, "He spoke with such warmth and joy [about Marceline]. It wasn't until I was older that I realized that he had only lived there about five years. I really thought he had spent his whole life there in Marceline." In 1950, when designing a barn for the backyard workshop of his home in Holmby Hills, California, Walt designed it as an exact replica of the one on his family farm in Marceline. Walt had a sincere and passionate commitment to wildlife and nature. It was an awareness that was born from his early childhood years on his family's farm in Marceline and remained with him for the rest of his life. He wanted to share that awareness with modern generations of children who would never have that same opportunity since the world was changing so quickly. That desire was the inspiration for a personal entertainment non-profit venue project that was called The Marceline Project and later Walt's Boyhood Farm. It was abandoned after Walt's passing and the need to commit all resources to the Florida Project later called Walt Disney World. Marceline is about 120 miles northeast of Kansas City and was incorporated on March 6, 1888. The Atchison, Topeka and Santa Fe Railway built a line from Chicago and Kansas City in 1887, and Marceline was developed along the route as a stop for refueling, water and crew changes. The train no longer stops there and hasn't for quite a few decades. In the spring of 1906, Flora and Elias Disney were living in Chicago, Illinois with their five children: Herbert, 17; Raymond, 15; Roy, 12; Walt, 4; and 2-year-old Ruth. Chicago was rapidly growing and as part of that growth, the violent crime rate was also increasing and this worried Elias. The final straw was when two neighborhood boys were arrested for killing a policeman in a car barn robbery. One was sentenced to Joliet Prison for 20 years and the other to life imprisonment. The boys were about the same age as Herbert and Raymond. Elias' brother Robert already owned a 500-acre farm in Marceline, and so Elias decided that Marceline would be a good place to raise his family in a healthier environment. Elias purchased a one-story house and 45 acres of land just north of the city limits for $125 an acre. 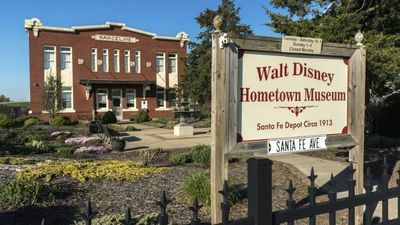 Walt's Hometown Museum in Marceline, Missouri. Walt had fond memories of his childhood in Marceline, in later years often corresponded with people still in the town, and always made time for visitors from Marceline no matter how busy he was if they happened to drop by the Disney Studios. Walt spent roughly five formative years in Marceline from 1906-1911 and its influence on him is easily seen in aspects of Disney films and Disneyland. With the popularity of Walt's weekly television program and the opening of Disneyland, Walt was quite well-known, so it was no surprise that Marceline decided to honor its favorite son. The city fathers wrote to the Disney Studios asking if they could have permission to name their new swimming pool and park after Walt. At first, the Disney Studios was suspicious that the Marceline city fathers were looking for a sizable financial contribution, but once they were assured that everything had already been paid for (approximately $78,500), they quickly agreed. Walt wrote back that he was thrilled and inquired whether there was to be an official dedication that he could attend. The Walt Disney Municipal Park and Swimming Pool was to be dedicated July 4, 1956, in Marceline. Posters and banners welcomed back the two Disney brothers who arrived the day before the event. At the time, the population of the town was 3,172. Today the population is closer to 2,500. Festivities during Walt and Roy's visit included Walt judging a local bathing beauty contest and the premiere of a new Disney live action film, The Great Locomotive Chase at the Marceline Uptown Theater. "Walt and Roy stood outside and greeted every child that went into the theater," remembered Kaye Malins, who attended the premiere as a child. "When Walt took the stage that day he said, 'You children are lucky to live in Marceline. My best memories are the years I spent here'." Walt and Roy took time to leisurely meet with the townspeople and explore their old haunts from the local school to a huge tree that had been on the Disney farm. During that visit, Walt told reporters, "I don't know if you are aware that I was quite a pig rider. I would jump on the old sow's back, grab her ears and off we would go to the pond where she would dump me." Walt would later claim that pig was the model for one of the foolish pigs in his animated short Three Little Pigs (1933). Walt also stated that a chicken that he called "Martha" would lay an egg for him on command. He was especially fond of a horse named Charlie who was a sway-backed, gray-dappled horse that pulled the Disney buggy. During his time in Marceline, Walt reveled in memories of his boyhood there including the Wolf River apples he would pluck from the orchard on the farm for his mom to make a pie. After the official dedication of the park and pool, there was a small display of fireworks in the sky. Event organizers had avoided giving the Disney families rooms in Marceline's Hotel Allen because it lacked air conditioning, but they didn't want the families to stay in a hotel in nearby Brookfield. Rush and Inez Johnson had a brand new house on 905 North Kansas Avenue and the Disneys stayed there while the Johnson family stayed with neighbors. Walt and Lillian slept in the room of the Johnsons' 7-year-old daughter Kaye. The Johnson home was one of only three locations in Marceline that had central air conditioning in 1956. They had helped a friend who was getting into the air-conditioning business and wanted to try out his new product on their house. "Of course, everyone in town knew the Disneys were coming, In those days, we didn't have social media, but word got around. Our friends had very nice furniture, but no air conditioning, so they said, 'We'll help you.' And they furnished our house with their good stuff. "Then they hired the chef of the Santa Fe Railroad driving car to cook for the Disneys while they were here. What an impression he made with that chef's hat. As it turned out all that fussing was for nothing, they were the dearest, warmest people and didn't care for any fanciness." "After everything was over, he and I retired to our den," Rush recalled. "He settled back in an easy chair and sipped some scotch as he talked about his memories of his hometown. "He said he had a dream to re-create that time, have a turn-of-the-century farm that people could visit with pigs, chickens, horses, cows, a swimming hole, field of grain, orchards and so much more. "He asked, 'Rush, who owns the Disney family farm?' I told him and he said, 'You can buy it cheaper than I can. Buy it'." "He was such a visionary," remembered Johnson's daughter Kaye Malins, "He said there will come a time when a child will not know what an acre of land is. There will come a time when a child will not know what happens when you put a seed in the ground. We're there now." When Rush expressed concern that Marceline was too off-the-beaten track to support such a project, Walt smiled and told him that to just wait until during introductions to the popular weekly Disney television program Walt would look at the camera and smile and say, "When you are visiting Missouri, make sure you stop by and see my boyhood farm" and just like Disneyland, there would be shows devoted to the building and continuing operation of the attraction. For security purposes, it was called the Marceline Project with no reference to Disney for fear that the cost of the necessary land would soar if people knew Disney was building something. Actually Walt had written a letter a decade earlier in 1946 to Floyd Shoemaker, then the executive director of the State Historical Society of Mississippi at the University of Missouri-Columbia exploring a similar idea. Johnson, Bill Washam and others for Marceline formed a board of directors for a not-for-profit educational foundation. Harrison "Buzz" Price and his ERA company had done a preliminary survey for Walt that showed even with all the publicity Walt could give to the venue, it would still be difficult to turn a reasonable profit. So, Walt decided it would a non-profit venture. Rush first bought the 45 acres that comprised the Disney house and original farm acreage. Then Walt requested that adjacent farmland should also be purchased for expansion. "Walt expected Marcelians to come up with funding that he would match from his private corporation, Retlaw Enterprises. FHA was willing to commit one to two million dollars which excited Walt but when FHA mentioned going as high as six million dollars, Walt said we would have to go to Roy for matching funds on that amount." "Roy was excited about the project but not as excited as Walt. Roy would remind me that his brother was a dreamer and not always realistic. Roy would actually spend more time asking me about his old classmates, especially the girls. "We made many phone calls back and forth and over the decade. I made about 10 or 12 trips out to the studio in California. Over that time I became not only a business partner but a friend. "He always had a map of Marceline on his desk in the upper-left corner and his secretary told me it was always there, not just pulled out for my visit. When I visited, we would go over it in detail. "Almost immediately, he had sketched out roughly in pencil on a sheet of paper his plans of what he wanted the place to be. "Among other things, he had sketched in a motel in the upper right of the property for people to stay. In the middle left was the fishing lake. Nearby was a barn for a barn dance activity and a café. "Activities for children would include what he wrote as a 'buggy train, miniature golf and a horseshoes area'. In addition he had plans to re-create an old-time butcher shop, barbershop, general store, haberdashery, pool hall, and an old service station." Inez stated, "His rural influence as a young boy stayed with Walt for his entire life. He knew that the simple pleasures of life are worth more than we sometimes think they are. Walt imagined a living history farm where young and old could relive a simpler time and discover the roots of this country." Rush and attorney Harry Porter worked with the Missouri Highway Commission to encourage it to build a three mile stretch of four lane road north from Marceline to U.S. 36 the heavily traveled road connecting Hannibal on the east and St. Joseph on the west. The Commission was planning to buy more right-of-way for the expansion and was doing surveys. Then-Governor Warren Hearnes who had been let in on the plans helped persuade the highway commission to approve the road expansion. The Missouri Division of Resources (tourism) and the Missouri Division of Commerce Industrial Development became involved, as well. When changes were being made at Disneyland, Walt donated the Disneyland Midget Autopia attraction to Marceline in 1966 and the official dedication was scheduled for July Fourth. With the help of Admiral Joe Fowler overseeing the installation and training, it ran for eleven years. It remains the only Disney ride ever to be relocated and operated. Days before the ceremony, Walt cancelled attending saying that he had a cough he just couldn't shake. A few months later in December, he would pass away from lung cancer. With Walt's death in 1966, work on the project slowed considerably as all the resources of the Walt Disney Company were focused on the building of Walt Disney World. With Roy's death in 1971, the project was completely abandoned. Retlaw Enterprises had purchased roughly 250-300 acres with options on up to 500 more acres. Time, talent and money could not be used on a project that wouldn't generate immediate needed income for the company. With Roy's death in 1971, the project no longer had a champion in the company and Rush helped sell off the land at half what Disney had paid for it. While selling off the land holdings, Rush bought the original Disney 45 acres that included the Disney family house, the Dreaming Tree and more for himself and his family. The current owner, Kaye Malins, raised her family there. When she married Wally Malins, her parents gave the couple the Disney family home and farm as a wedding present. Today Kaye operates the Walt Disney Hometown Museum in Marceline. Kaye said, "When children come to Marceline, we'll say, 'How old are you?' and they'll say, 'Oh, I'm nearly 5'. "We'll say, 'That's the exact age Walt Disney was when he came here." Suddenly it's like an epiphany. They think, 'Goodness, he was a farm boy?' Yes. 'He did chores?' Yes. And look what happened. Look what he aspired to become. So anything in possible. In Marceline, you truly do know anything is possible. "The Marceline Project was going to be a general living history farm in Marceline, where it all began for him. He wanted to have a working 1900s farm to show people, to get them involved in it, to learn respect for animals and nature. It would have re-created his childhood with the same technology, animals and other elements. The land had been purchased. The feasibility studies had been done. The governor of Missouri was going to put a four-lane highway in to Marceline. And then Walt passed away. We mourned with the rest of the world." When Walt died, on his desk of his formal office was his concept sketch for the project. Roy took it out of the office and gave it to Rush. Today, it is displayed on the wall of the Disney Hometown Museum in Marceline. Dave Smith and the Disney Archives had no idea the drawing even existed until it was put on display. It was just another of the many unbuilt dreams of Walt Disney.